Woofs and Wiggles provides dog daycare and boarding in our specially designed ten thousand square foot facility. Our unique space offers your dog comfortable indoor areas furnished with bedding, blankets, and toys for enjoyment. Each four legged guest also has unlimited access to the adjoining outdoor patios. 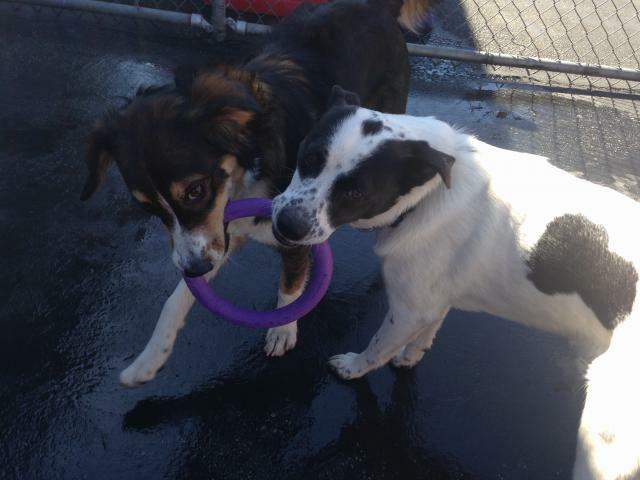 Each patio has play structures for climbing, pools for warm days, and plenty of furry pals to socialize with. All dogs are at liberty to move between inside and outside at their leisure. We also feature three separate grass areas. Our detailed application allows plenty of opportunity to describe how your furry companion would best enjoy their stay. Our guests are grouped by activity level, habits, and disposition to assure a fun-filled and comfortable stay with other like-minded hounds.